* This property does NOT have access to the private Moonlight Club/Moonlight Lodge. Ski-in/ski-out from 'The Gambler Chalet', truly amazing, luxurious, 2 bedroom/2.5 bathroom Saddle Ridge. Take a few steps to the Iron Horse Lift or just spend time in your own private hot tub. Whatever your desire, this ski-in/ski-out Saddle Ridge has it all. You will feel right at home in 'The Gambler' with our rustic hardwood floors and comfortable furnishings. The layout of our townhome will provide more than enough space and luxury for the escape from reality that we are all looking for. As you walk into our townhome, the main level opens to the kitchen, vaulted great room with gas fireplace, dining area, and breakfast bar. Walk out on our deck to take in the amazing views while cooking on our gas grill. Upstairs you will find the master suite with a king bed and private bath. As you make your way downstairs from the main entryway you will find bedroom suite number 2. This room, also with its own private bath, contains a queen bed and a twin/twin bunk bed. Walk out from here to your own private hot tub with views of Lone Peak and the Big Sky Valley. This property is perfect for a family or 2 couples or a small group of singles looking for luxury lodging at a great rate, fantastic views, and ski-in/ski-out convenience. If you have not been to Big Sky and you are looking for the best ski-in/ski-out location on the mountain, then look no further than Saddle Ridge in Moonlight Basin. These town homes sit on the ridge that adjoins Big Sky and Moonlight Basin, so you have the entire mountain at your finger tips. Summer is the icing on the cake. Yellowstone National Park is Only 45 minutes away. The drive to West Yellowstone is amazing! Also, just outside your door you can spot deer, moose, elk, and lots of other wildlife. The Gallatin River offers some of the best blue-ribbon fishing and whitewater rafting in North America. Come stay in our Saddle Ridge townhome and enjoy some time under the Big Sky. **We rent 26 ski-in/ski-out properties, all in Moonlight Basin, so if this property is not available, please contact us today. We live in Big Sky full time and we are a boutique, family owned property management business that adores Big Sky, Moonlight Basin and all of Yellowstone Country and sincerely believes that your vacation here should be your best ever. We love to ski, snowboard, hike, fish, and enjoy the amazing Montana sky and outdoor activities. We know Saddle Ridge, Cowboy Heaven, Moonlight Basin, and Big Sky extremely well, and we believe there is no better place to spend your winter or summer vacation. We first vacationed in Big Sky in 2003 from Nashville, TN, and fell so in love with the area that we moved our family of 5 here full time in 2007 and have LOVED every minute of our life here ever since. We know the importance of finding the perfect lodging and will work with you personally to make your vacation to Big Sky, Moonlight Basin, and Yellowstone your best vacation ever. After all, a good day on the slopes begins with a good night's sleep and a great place to cook breakfast. We know that each day should also include a warm fireplace waiting for you at the end of the day, a hot tub to cure the weary muscles for the next day, and great mountain views for you and your family and friends to soak up and escape reality. Since we live in Big Sky full time, we are here to take excellent care of you every minute of your stay. All of our properties are beautifully decorated and impeccably clean. We inspect them personally before each arrival. We provide everything from trip planning information to a turn key vacation rental that everyone dreams about. We look forward to hearing from you and helping to make your vacation in Big Sky your best vacation ever. We personally own 2 Saddle Ridges and 2 Cowboy Heaven Cabins and we manage 26 total Moonlight properties. ** If this unit is not available or if you are searching for more than 1 unit, please contact us at Saddle Ridge Rentals or Moonlight Rentals or email us today! This property has all of the elegance that you would want in a vacation rental, along with the rustic Montana feel that everyone is searching for. From the rustic hardwood floors, stone fireplace, exposed logs in the high vaulted ceilings to the granite counter tops, walk-in slate shower and all new private outdoor hot tub. Property is as nice as it seems from the photos. Kitchen is excellent and plenty of room. Beautiful property, would definitely stay at the same place if going back to Big Sky for skiing. The condo was clean with beautiful views of Moonlight Basin ski lifts. The condo management was extremely responsive and provided us with all the details we needed to make our trip easy and comfortable. We ate most breakfast, lunch and dinners at the condo and the condo's kitchen met all of our needs in regards to cooking. This was our first time skiing in MT, historically, we have gone to Deer Valley, UT. The reason for the 4 stars versus 5 stars was the condo's relationship with the Moonlight Basin Lodge. 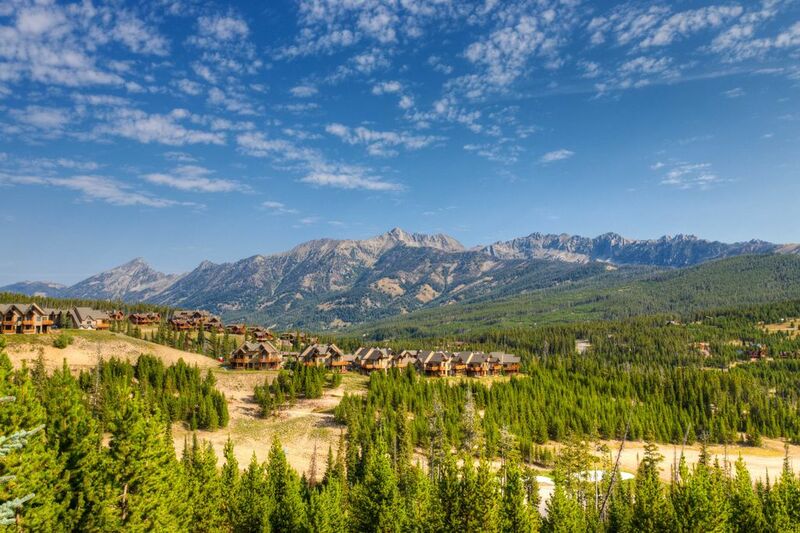 The Moonlight Basin Lodge is very close to the condo and offers many of the typical ski vacation offering such as continental breakfast, lunch access, apres ski access, pool, workout facility and activities for the kids. However, the cost for access to the Lodge was an additional $100 per day (meaning you couldn't even walk into the Lodge to eat or drink without the $100 per day fee) , which we paid. Unfortunately, Moonlight Basin is still ironing out their service offering. Our first 2 mornings at the continental breakfast they ran out of coffee (by 7:30am), plates, and various other foods. After the 2 strikes, we decided to forgo the free breakfast and ate it in the condo. There were 2 days where the mountain was busy, so we decided to use the Moonlight Basin Tavern to eat lunch. Both days, took over an 1.5 hours (someone working for the Lodge told us that the day before, it was over 2.5 hour lunch turnover). At lunch time, only about 30% of the seating in the restaurant was occupied. We were told we couldn't sit at an empty table mainly because the kitchen was overwhelmed and couldn't keep up with the holiday crowd. It was then we decided to eat lunch at the condo instead of spend over an hour waiting for lunch. We did 1 apres ski at the Tavern at Moonlight Lodge, and we waited so long for a drink and a check, we never went back. Lots of the employees at Moonlight Lodge were friendly and helpful despite the low service levels, but some were not. So, I guess the lack of 5 stars really does not reflect the condo but its association with the Moonlight Tavern Lodge. We loved Big Sky and the skiing so we will be back and hope that the Moonlight Lodge has figured out its service issues. Thank you so much for renting from us. We are thrilled that you enjoyed your stay and that the condo met all of your needs. Our goal is always to help our guests have their best vacation ever, so we are very sorry to hear that you did not have a great experience at the Moonlight Lodge. We are a lodging company and do not have an association with the private Moonlight Club/Lodge. The Moonlight Lodge is a beautiful Lodge with an upscale bar and restaurant that has been open to the public since it opened in 2000, however, on December 15, 2017 the developers of Moonlight Basin made the Lodge completely private and part of their private Moonlight Club - accessible only if you are staying in a Moonlight Club member property and you pay the daily fee that you mentioned.The Moonlight Club has already made adjustments to avoid the problems that you faced. I agree that it sounds like they need to iron out their kinks. As of February 19, 2017 this specific property will no longer have the option to access the private Moonlight Club/Lodge. We would love to have you back again as our guest in the future. We rent 25 properties - all ski-in/ski-out in Moonlight Basin. Thanks again for renting from us. This was an awesome place to stay! Highly recommend. Owner puts much effort to ensure a perfect stay. Great location and view. This was a great home for the four of us. We didn't spend much time there with all the activities in the area we enjoyed. The home was very spacious, clean, and the western look made us feel like we were in Montana. Being from an area that is very hot and humid in the summer, we really enjoyed siting out on the deck and breathing the fresh air. We had everything we needed to enjoy our stay and would highly recommend this home. Thanks for a great stay in Montana. This rental unit was perfect. It was spotlessly clean and amply supplied with everything we needed. Acra included links to significantly discounted services like vehicle rental, grocery delivery and ski rentals. The furniture and beds were fresh and comfortable. I will be back! Thank you so much for renting from us. I am thrilled that you enjoyed your stay and loved the unit. We would love to have you back again in the future. I rented this property with 4 friends and we had a wonderful time! The space is awesome, really well appointed and decorated. The rooms are spacious and comfortable, and provided a great environment for evening meals, hanging out by the fire, enjoying the hot tub, and taking pictures of sunrise over the mountains. You really can't be closer to the slopes, and we enjoyed sledding down the back hill at the end of the day. We loved this place and would definitely stay here again. Thank you for everythign! Thank you so much for renting from us. We look forward to having you back in the future! 13% applies to taxes/fees 50% due at the time of reservation and remaining balance due 30 days prior to arrival date We accept Visa, Mastercard, Discover, American Express. Damage Protection Plan covers up to $1500 in unintentional damages to the rental unit interior during your stay.